SAT., Nov. 22, 10:30 am - MOSAIC TRAINING WORKSHOP for Mosaic Murals " " " " " "
Every TUE and WED, Nov. 25 & 26 thru Feb. 25 & 26, OPEN MOSAIC WORKSHOP for Mosaic Murals, These murals will be located on curved display walls on the path up to the ped/bike bridge over the Beltline near Whenona/Britta/Axel. WED. Nov. 26, 5-8 pm - OPEN MOSAIC WORKSHOP for Mosaic Murals, " " " " " "
THUR. Dec. 11, , 7 pm - DMNA Council Meeting, Prairie UU Society, 2010 Whenona Dr. TUE., Dec. 16 , 2-5 pm - OPEN MOSAIC WORKSHOP for Mosaic Murals, " " " " " "
1 - Dunn’s Marsh Mosaic Mural Making Workshops Begin 11/18. FREE! 1 - The Dunn’s Marsh Mosaic Mural Making Workshops Begin 11/18. FREE! Beginning the week of November 17th, I will be holding three Mosaic Training Workshops. Each of these three Workshops will cover the project’s goals, a short exercise on collaboration, and lessons on working with the mosaic materials. If you are interested in an opportunity to become familiar with the materials we’ll be using during the creation of the Dunn’s Marsh Mosaic Project, feel free to attend any one of the three Workshops listed below (all three Workshops are identical—you need only attend one). Please try to arrive within the first half hour so you can participate in the entire training session. Parking on site is limited to three spaces only—please park on Danbury St. if three spots are already taken. Starting Nov. 25, and running all the way to the end of February, Open Mosaic Workshops will be held every Tuesday from 2:00 PM to 5:00 PM and every Wednesday from 5:00 PM to 8:00PM. Additionally, a Saturday workshop will be held once a month—dates to be determined. If you can’t make it to one of the three Mosaic Training Workshops listed above, you are still more than welcome to join us for the weekly Open Mosaic Workshops where you’ll be taught the techniques necessary for helping create this wonderful community mosaic project! The workshops will be held at 4269 W Beltline Highway, Suite B. (Corner of Danbury and Frontage Road). 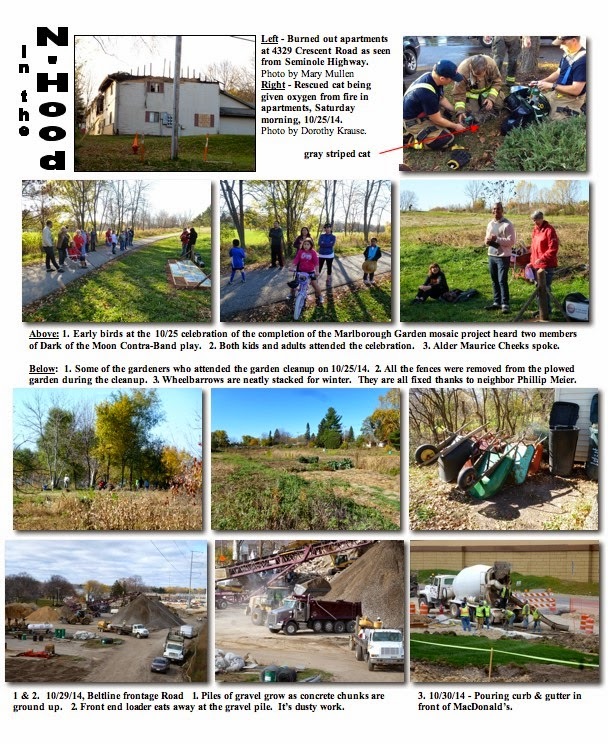 This project is another wonderful way for community members to work together. Please invite your friends and neighbors to help create these beautiful murals inspired by the Dunn's Marsh Community. The Department of Transportation has scheduled a series of public involvement meetings to discuss preliminary findings of a study working on safety and mobility issues along the Beltline. Preliminary findings from study will be presented at the meeting. Many of the strategies have been investigated in the past 10 years by the city, county, and state, official said. The new study looks at how well strategies address current regional transportation and Beltline challenges. Some meetings have been held already, but information will be presented at [several] additional meetings. from Fitchburg Public Works Dept. December’s Green Thursday film, Unwasted: The Future of Business on Earth, details the impacts of business waste, discusses zero waste as a key element of the sustainable business model, and covers ideas for sustainable business practices. The Fitchburg Farmer’s Market moves indoors this Thursday, Nov. 6th from 3:00-6:00 p.m. just up the hill to the Fitchburg Community Center, 5510 Lacy Road. Fall favorites and summer staples are still available at the market through December. If you find some dead strings of holiday lights while decorating for the holiday season, you can now bring them to Fitchburg City Hall for recycling between November 3, 2014 and January 30, 2015. A special cart is now available 24 hours/day in the City Hall Lobby, 5520 Lacy Road. Fitchburg residents can drop off non-working holiday light strings and extension cords for recycling. Residents must remove any bulbs larger than marble-size and recycle those separately at participating stores. Alternate Side Parking is in effect city-wide with the exception of the Snow Emergency Zone <http://www.cityofmadison.com/residents/winter/parking/SEZ.cfm> (unless there is a Declared Snow Emergency <http://www.cityofmadison.com/residents/winter/parking/declaredSNowEmergency.cfm> ). The Snow Emergency Zone is only in the downtown area from the vicinity of the Kohl Center to Tenney Park. Park on the EVEN house numbered side of the street on even numbered days from 1 am-7am. Park on the ODD house numbered side of the street on odd numbered days from 1am-7am. Violations of the Alternate Side Parking rules are subject to a fine of $60 when a Snow Emergency HAS BEEN declared. Plus you will have to pay a $50 towing fee. At its organizational meeting on November 13, the Dunn’s Marsh Neighborhood Council elected officers for the year and also appointed Joe Maldonado as the 11th Council member. Three officers agreed to stay on for another year, and a new secretary was elected as shown below. Mary Mullen and Yannette Cole live in the Marlborough part of the neighborhood. Tony Williams lives in the Crawford area, and Karen Walters lives in the Belmar area. The DMNA Council may have a total of 12 members. Since just 10 were elected at the annual meeting on October 9, the last 2 members may be appointed. One must represent the Allied area since all 4 parts of the neighborhood have the right to at least one place on the Council, and all the other areas are already represented. Happily, Joe Maldonado, a Belmar resident for a number of years, agreed to serve on the Council. Dorothy Krause, previously on the Council, declined continuing to encourage Joe’s election. We are very glad to have him, and since he works at the Boys and Girls Club, we hope he can recruit someone from the Allied area to fill out our complete quota of Council members. 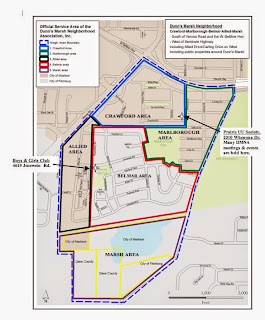 The attached map shows the different areas of the Dunn’s Marsh Neighborhood. They joked about getting the “green card” at the organizational meeting of the 2014-2015 Neighborhood Council meeting on November 13. No, it wasn’t the immigrant’s green card that makes it legal to work in the U.S. Instead it was a lime green card tent card that listed all the topics to cover when each Council member did a self-introduction. And it really worked. Even though some of us have known each other for years, new things came out. · Most were born and grew up in another state or had lived in another state for an extended time. · One had lived overseas in Frankfurt, Germany and London, England. · At least 3 had moved from their home area to come to a better place to bring up their kids. · Six of the 8 who checked in have kids, though some of those kids are grown. · Many occupations are represented. In short, we are a group with lots of experiences and, of course, the desire to make the neighborhood the best it can be. First to be introduced are the four DMNA Council members at the 11/13/14 meeting who are not officers. Ann Marie Hughes and Joe Maldonado are new this year. Thea Bach, formerly our secretary and a member of the Council since 2011, is one of the 2 Council members born in Chicago. Her father moved from there to the northwest Chicago suburbs so as not to be in a gang. Dubuque was her home for some years since she’s been married, but she has lived in Madison with her husband John for quite a while. (John was on the Council in 2010-2011.) Thea is an LPN but in the past has been a social worker. She’s an optimistic person, an “includer,” who likes to bike, hike, read, and sew. Thea, John, and their young, rambunctious dog live at 1905 Danbury Street. Thea’s interest is to form a positive community here. Ann Marie Hughes, elected for the first time to the Council this fall, hails from Brooklyn, New York. Her husband, a union stone setter, often has stone work in New York, and in fact has worked on the World Trade Center there. She’s the one who has also lived in Frankfurt and London. Like Thea, Ann Marie has lived in Dubuque. Ann Marie and her husband have 3 children, Teddy, age 12, Finbar, age 15, at home, and her daughter Kayleigh, who at age 19, has flown the coop. The community is a strong interest of hers. She also likes to write. Ann Marie lives in the Marlborough part of the neighborhood. You’ll learn that she’s no wall flower. Denise Williams, from Chicago like Thea, grew up in the Robert Taylor projects. Not so jokingly, she said she left because of the rats. In 1999, like Tony, she moved to Madison for the good of her son. Currently Denise is employed at Einstein’s in the neighborhood. She loves working with kids and she loves to cook. She joined the DMNA Council last year “to be with my husband” Tony. They were married in 2011. Denise is in her second year on the Council. Joe Maldonado is our newest member of the Council. Puerto Rican, he grew up on the north side of Milwaukee which he described as “very segregated” compared to Madison where there are pockets of minorities. He’s lived in several places in or close to our neighborhood: PD until his apartment building burned, Crescent Road in our neighborhood, and now in the Renaissance part of Belmar. He works at the Boys and Girls Club with pre-college kids as the Teens of Promise College Continuation Manager. Joe loves the diversity of the neighborhood. Biking, gardening, and cooking are favorite pasttimes. He has a chicken (used to have more) and a garden. His son, age 8, does drumline with fellow DMNA Council member Karen Walter’s daughter. His wife is from the Dominican Republic. Regarding why he is joining the Council/DMNA, he said he believes that “If you’re not at the table, you’re on the menu.” We are very happy to have him at the table with us. Vice President Tony Williams started out in Evanston, IL but moved in 1992 to Madison to give his kids better opportunities in life. His girl and 2 boys are now grown and positively involved in careers or preparation for careers. One boy is an engineeer, another working to be a professor, while his daughter is in nursing. Tony is a retired security officer, having been the CEO of Top Flight Security which often did security for parades that included important officials. His life has taken a turn: having got involved with Second Baptist here in the neighborhood about 7 years ago, he’s gone from being a student to a deacon and is now a pastor in training. Still, fishing and watching TV are favorite pasttimes. Tony remarked that in his 11 years on Britta Parkway, he’s seen a tremendous shift for the worse that he wants to reverse. Tony is in his second year on the Council. Karen Walters is one of two native Wisconsinites: she was born in Green Bay. However, she went to college in Massachusetts and has lived in a lot of different places in Wisconsin including Milwaukee, Beaver Dam, and Waupun. Karen works for the State of Wisconsin in Corrections. For fun she paints, stitches, and cooks. She has a 14-year-old daughter and lives in the Belmar part of the neighborhood. Like Tony, Denise, Yannette, and two other members of the Council, Karen is starting her second year on the Council. Treasurer Yannette Cole has lived 18 years in Madison and was the first of 3 sisters to move here from Puerto Rico. She and her husband Jesse have a son Jesse who graduated from West High last spring and is now out on his own. Yannettte works for a private medical firm that provides alternate cancer treatment. She loves her job working with their computer system churning out reports. She also loves photography although she has not done much lately. That’s not true of another major interest, cooking. Cooking creatively is a constant activity. Yannette and her husband bought a house in Puerto Rico this past year. We hope she plans to stay here for a long time, regardless of that purchase. Yannette jokes that she was “forced to join the DMNA Council” last year. Hmmmm. By whom? Maybe her sister Heidi who is also on the Council? President Mary Mullen comes from the small town of Wauzeka in southwestern Wisconsin where she grew up with 6 younger siblings. Her father was a minister and her mother a former missionary. Mary went to college in Naperville, IL, moving into the Dunn’s Marsh Neighborhood in Madison early in 1963 after a few months living in Barneveld where she taught high school English and German. Since then except for 4 years when she lived on Seminole Highway in Nakoma she’s been in the Marlborough part of the neighborhood, first on Windflower Way and then on Milford Road. She has also worked for the State of Wisconsin and for 13 years taught fourth grade at Brooklyn Elementary School in the Oregon School Distsrict, retiring in 2005. She and 3 other neighborhood women started the DMNA in 1973 after the Madison alder and the county supervisor suggested they establish a homeowner’s association to support their candidacy. Having been a member of the League of Women Voters, she knew it would be the kiss of death to form a neighborhood association simply to support a candidate. The group of 4 women also decided that the DMNA should be open to all residents of the neighborhood - homeowners and renters alike. Mary loves to garden, plays in a women’s folk band, and belongs to a memoir writing group that meets at the Meadowood Community Center. Next time, we’ll hope to hear from Lucy Blue, Heidi Figueroa, and Rachel Potter. Election turnout on November 4 was high at the Ward 76 polls for the Madison part of the neighborhood. Turnout even beat the city average! At the Ward 76 polls in our neighborhood, these were the results on the tabulator tape. 629 ballots were cast including absentee ballots. Originally in the poll book there were 886 registered voters listed. 152 voters registered at the polls. Some of these were in the poll book but had moved within the neighborhood. In all cases, the Democratic candidates came out way ahead of the other candidates. Here are some of the statistics from the tabulator (machine that counts the votes). For Governor: Mary Burke 566 (90.4%) Scott Walker 55, Robert Burke 5. For Attorney General: Susan Happ 542 (88.3%), Brad Schimel 58, Thomas Nelson 14. For Secretary of State: Doug LaFollette 543 (89.2%), Julian Bradley 48, others 18. All referenda passed in our ward with the following results. Statewide referendum on protecting the Transportation Fund through a constitutional amendment: Yes 419 (71.2%), No 165. County question on raising the minimum wage to $10.10: Yes 544 (88.6%), No 70. County question about accepting federal money for BadgerCare health insurance: Yes 575 (94.7%), No 32. A few weeks ago I had a reason to be in the Boys and Girls Club. When I walked into the hallway, I couldn’t believe the transformation from the previous time I’d been there. Replacing the boring pale yellow institutional cement-block wall was a bright and vibrant mural. The mural shows many activities that take place in the neighborhood: basketball to biking, jump rope to barbequeing, graduation to gardening. Specific locations are shown too: the basketball court, but also the Boys and Girls Club and the Revival Ridge apartments. All is set against rolling golden hills with paths leading from one activity area to another. The Capitol rises behind a group of graduates. Enjoy the collaged photo of the mural which is attached. Better yet, go over and see this colorful mural. 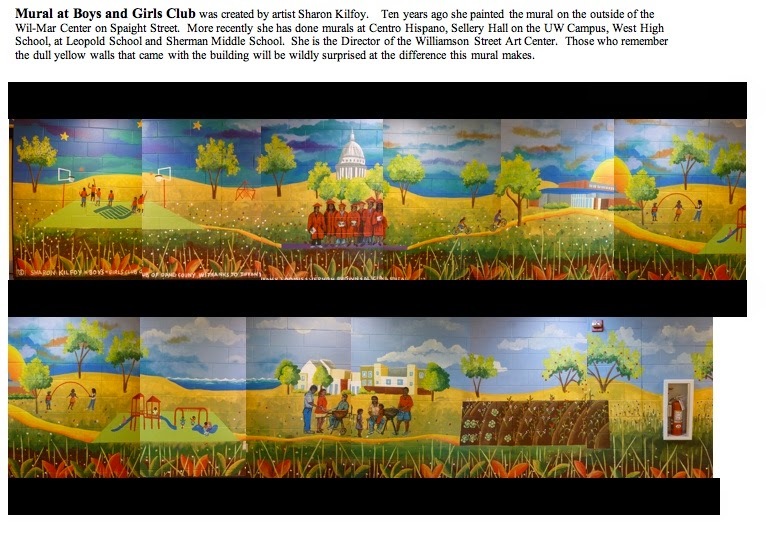 The muralist is the local artist Sharon Kilfoy who is the Director of the Williamson Street Art Center. She’s done a lot of murals in Madison, many in schools. Usually she has involved the community in the production. I’m looking to find out more about how the B&G Club mural came about. 1. On our side of Verona Road the Beltline Frontage Road that has been closed for a long time between Whenona Drive and Britta Parkway (at Einstin’s) should be OPEN before November 21. WHOOPIE! 2. On the other side of Verona Road, the Verona Road West Frontage Road between Freeport Road and Home Depot, will be CLOSED to through traffic until spring 2015. 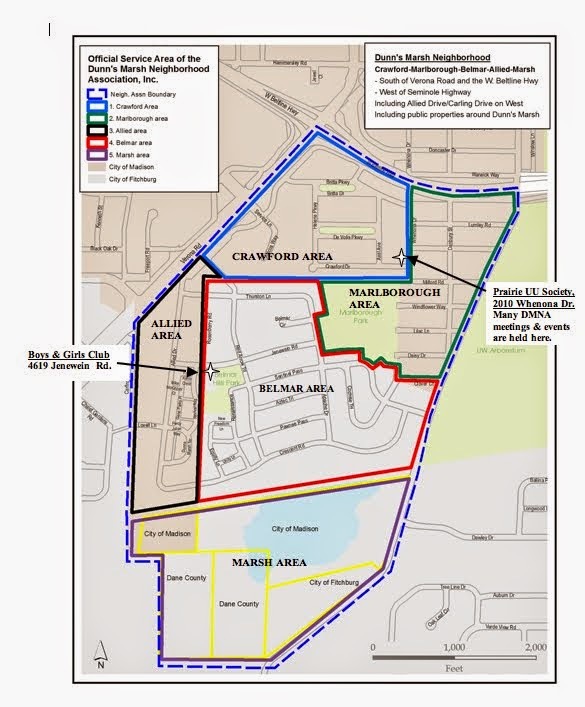 Traffic can continue to use the Freeport Connection (the temporary road under Verona Road near Allied Drive) to go to Raymond Road and can use the roundabout to get to U-Haul, Home Depot and points toward the Beltline. 1. On the Beltline, eastbound between Whitney Way and Seminole Highway, traffic will remain shifted to the right shoulder on narrow lanes as at present all winter until Spring 2015. 2. On the Beltline, westbound between Verona Road and Whitney Way, traffic will remain shifted to the right shoulder on narrow lanes until Spring 2016. The Madison West District Police Blotter notes that MPD officers responded to 4,190 incidents in the district in October. This is an average of 135 incidents a day. The West District is a very large district that includes the Madison part of our neighborhood. 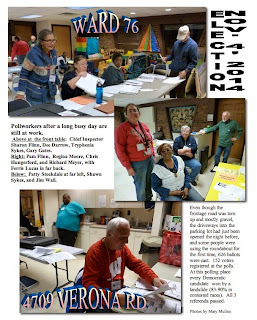 Tues., Nov. 3 - VOTE. VOTE. VOTE. VOTE. VOTE. 7 am-8 pm. #1-4. Thur., Nov. 13 - DMNA Council Meeting, 7:00 pm, Prairie UU Society. 1 - Madison Polling Place Driveways Are Open!!!! Address is 4709 Verona Rd. 2 - Yes, You Can Get to the Polls From Here! 3 - Tuesday’s Ballot. Know Before You Go. The road was all torn up and both driveways to the Madison polling place at 4709 Verona Road at the Dane County Parent Council were blocked. That fact generated a spate of communications to our elected officials and the supervisor of the Verona Road project. We have been assured by everyone including Madison City Clerk, Maribeth Witzel-Behl and the Project Engineer for the Verona Road project that we will be able to get to the building to vote on Tuesday, November 4. As of 9:00 pm, November 3, the route was finally open even though with all the orange barrels everywhere, driving there was intimidating. Look for big blue “VOTE” signs that will direct voters to the location. Here’s the e-mail from the Madison City Clerk that was sent out to the DMNA Neighborhood Council on October 28. The polling place for Ward 76 at 4709 Verona Road will be open for the November 4 election. Look for the blue Vote signs that the city will put up next Tuesday. Polls will be open from 7 a.m. to 8 p.m. If you have any questions, please contact the Madison City Clerk’s office at voting@cityofmadison.com or 266-4601. Please note that voters who live in the Fitchburg part of the neighborhood must go to Fitchburg Fire Station #2, 5415 King James Way. 2. Yes, You CAN Get to the Polls From Here! The big Verona Road change-over took place over the weekend. The change requires that Madison voters use the roundabout under Verona Road to get to the polls at 4709 Verona Road. It also requires Fitchburg voters to use that same roundabout to get to the polls at 5415 King James Way although in a slightly different way. More roundabout, you might say. Well, not exactly true. You can go a more roundabout way (pun intended) to the Madison polls by using Seminole Highway, Sentinel Pass, and Red Arrow Trail. And you can get to the Fitchburg voting location by going out Seminole and then PD. 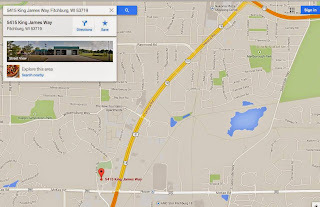 4709 Verona (frontage) Road is the Dane County Parent Council Building just across Red Arrow Trail from MacDonald’s. 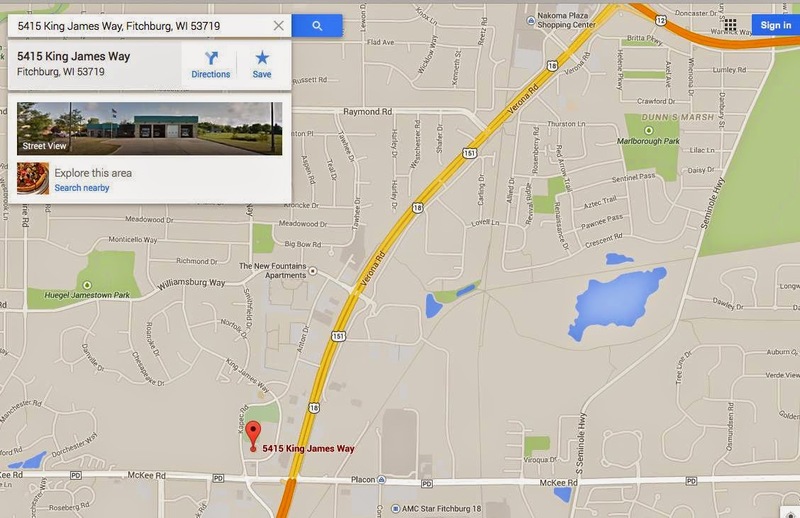 Driveways enter this location from both Red Arrow Trail and the Verona (frontage) Road. It’s a low building that was once a Pizza Hut (or was it Pizza Pit?). 5415 King James Way is Fitchburg Fire Station #2. Get there via PD west, then (after crossing 18/151) right on Kapec Road, and right again on King James Way. Polls are open from 7 a.m. until 8 p.m. If there’s a line 8 p.m., all voters in line at that time may vote. If you need a ride to the polls in our neighborhood, the quickest service would probably be from neighbors Sunshine Jones and JoAnn Kelley. To secure a ride from one of them, call 729-3869, and ask for a ride for a driver for Ward 76. This is the number for one of the campaigns, but if you ask for the drivers for Ward 76, you will be referred to Sunshine or JoAnn. Union Cab also offers free rides, but the wait could possibly be longer. Union Cab can take wheelchairs. Here’s information from the Union Cab website. If transportation or mobility issues may make it difficult getting to the polls, let us help! Union Cab wants to make sure that each and every vote gets counted by offering free cab rides between your home and your local polling place. Our taxis and accessible vans* will be available to serve you while polls are open**. Making an advanced reservation for your ride will help with timely transportation, but on-demand service will also be available whenever you are ready. Please make sure you allow plenty of time for wait and travel to and from the polls; it's going to be a busy day and we will be serving as many people as we can. *Accessible service may have a 30 – 60 minute wait. Please schedule service at least a day in advance, if possible. **Free service to the polls will end 30 minutes before the polls close. If you are already at your polling place and need a ride home, the free service will still be available. This is a non-partisan effort on the part of Union Cab. 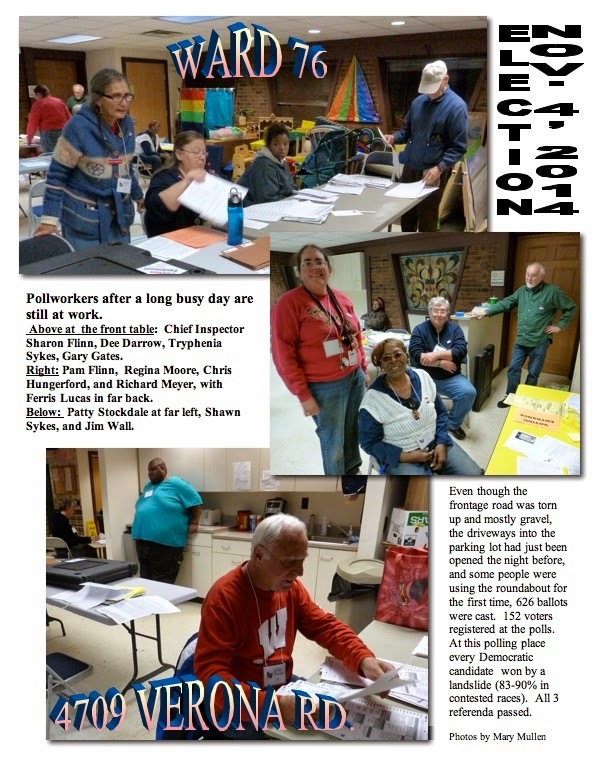 Our interest is to help people in our community exercise their right to vote. People who need transportation to their polling place will only need to call 242-2000. Rides will be provided between a person’s polling place and their home address. Know what’s on the ballot before you go to the polls. Besides candidates, there are 3 questions (referenda) that ask for a YES or NO vote. If you check the ballot, and you aren’t sure of how you want to vote or want to know more about the candidates or referenda, there are places to find additional information. Read the next article for those URLs. This site does not include the 2 Dane County referendum questions. Breathe a sign of relief. The Marlborough Community Garden Mosaic Stepping Stone project is not only complete, but it has been celebrated. A group of about 40 people gathered at 10 a.m. at the “Marlborough Community Garden” sign to celebrate the completion of the project and take a bow. The celebration started and ended with music by Inna Larsen and Mary Mullen from the women’s folk band Dark of the Moon Contra-Band. In between, people learned about the cost and about all who made the project possible. Two-thirds of the cash outlay came from the Madison Arts Commission. It was the $918 grant obtained by the Dunn’s Marsh Neighborhood Association. The grant will be paid once the final report and evaluations have been turned in to the city. Marlborough Community Garden put in all the front money ($918) that will be reimbursed by the grant plus $491 in match cash expenditures. Volunteer hours to make and install the 60 stepping stones amounted to over $4,000-worth of time. Quite the bargain for the city of Madison, as Alder Maurice Cheeks remarked. Volunteer time enumerated above does not include any of the time for preparing the grant, going to meetings, administrative time during the grant period, or any of the mowing to prepare for setting of the stones that was also volunteer work. The volunteers who spent many hours preparing the application for the grant and going to meetings were Christina Kantor, Micah Kloppenburg, and Mary Mullen. Mowing was done by Mark Selleck and Tom Hungerford. Recognition was given to organizations and individuals. Underlined people were present at the celebration. Madison Board of Park Commissioners - Approved the project. 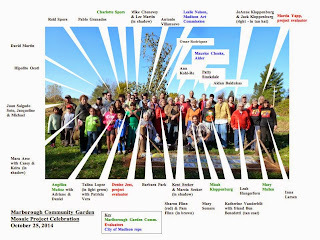 Marlborough Garden Management Committee (a) approved of the project, (b) provided all the matching funds (c) did mailing (d) served as the core group to help with the workshops including attending training workshops prior to the ones for all on July 17, 19, 24, (e) helped with installation. Attending from the committee were Micah Kloppenburg (helped with the grant application process, provided translation at both mosaic workshops), Charlotte Spors (childcare on July 17 & 19), Angelica Munoz (translation at workshops, sign installation) & her daughter Adriana (mortaring and translation at workshops) and son Daniel (digging for the garden sign), Mary Mullen (helped at all the workshops and installation days and took pictures). Although she isn’t officially on the management committee, Patty Stockdale is also recognized as part of this group since she removes the garden garbage and recyclables every week and helped at all the workshops and installation days. James Luscher is also a member of the committee (mortaring on July 17 & 19), but did not attend the ceremony. Dudgeon Monroe Neighborhood Association served as our fiscal agent because the Dunn’s Marsh NA does not have the required tax status. Special thanks to Dudgeon Monroe President Al Nettleton and Treasurer Julia Billingham. People were also recognized as individuals for their work. All those who made a stepping stone or helped in hauling them from the shelter to the shed on July 17 or July 19 and all those who helped grout or polish the stones on July 24 or did childcare. Attendance was 40 on July 17, 50 on July 19, and 30 on July 24. Attending from this group were Juan Salgado Soto and his children Jacqueline & Michael, Charlotte Spors, Patty Stockdale, Jo Kelley, Mary Mullen, Leah Hungerford, Katherine Vanderbilt, Ben Benedetti, Sharon Flinn, Pam Flinn, Barbara Park, Talina Lopez and daughter Patricia Vera, Angélica Muñoz with daughter Adriana. Those who helped set the number stones on August 24 or mowed the grass prior to that day. Mark Selleck & Tom Hungerford mowed. 30 people installed the mosaics. Several of the people who did this were named in the previous list. Hipolito Ocotl was present from this group and wasn’t named above. Those who helped with sign installation on September 20 or did prep before. Mark Selleck & Tom Hungerford mowed. Kent Seeker was our carpenter and also secured the lumber and made the little marker fence and generally oversaw the project. 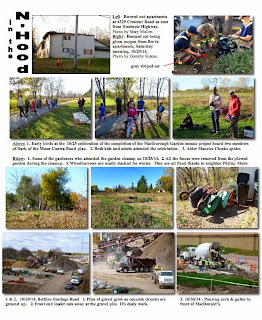 Other helpers with digging, hauling dirt and gravel, tamping, setting stones: Tom Hungerford, Patty Stockdale, Angélica Muñoz & son Daniel, Mary Mullen, Taylor Wahlig, Ashley Korchyk, Rachel Potter, and Phillip Meier. We ranged from age 7 through age 80. Especially important were the 3 men who worked all day on the project and actually were the ones who set the stones: Kent Seeker, Tom Hungerford, and Phillip Meier. Finishing touches between Sept. 23 & 26. Kent Seeker (fenceposts), Tim Brennan (Midwest Decorative Stone applied polymeric sand), Mary Mullen (applied polymeric sand, polished mosaics, backfilled edge of sign). Be sure to look at the two attachments. 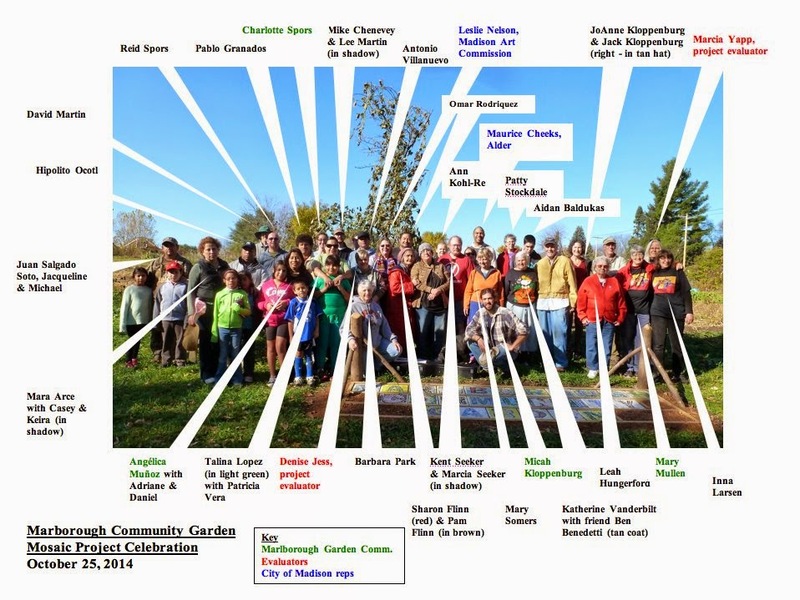 The group photo is labeled with each attendee’s name. It was quite a shock to ride up to the Badger State Trail bridge on October 30 and find the approach to the bridge including the wooden railings covered with graffiti: dirty words, dirty drawings, gang graffiti, and more. This nasty spray-painted trash “decorated” both ends of the bridge. Fortunately, I had my camera and took pictures. None of them are fit to print in this newsletter. Whom should I contact? Two people came to mind, City of Madison bike facility engineer Tony Fernandez and Bill Hauda, President of the Friends of the Badger State Trail. I sent my photos to them. In no time, actually less than an hour, I had received replies and copies of their forwarded inquiries and responses. Within the hour I found out who would be responsible for obliterating this rude tagging. It is Dana White-Quam of DNR. Thanks to everyone who responded. I’m impressed. Has anyone been out there in the last few days to check if the situation is remedied? In the October 22 e-News I reported using Madison’s Report a Problem website to notify the city of a street light that was dark. Unfortunately, although the report went in on October 21 and I got immediate replies on the 21st and 22nd, that light was still not fixed on October 30. I made another complaint on Report a Problem, and then because one of the original replies was from MG&E, I called. That was the ticket. By the next day, Halloween, the street light was fixed at Whenona and Milford Road.